Pastor Aaron talks through the meaning and significance of baptism, and helps our young people know what to expect. 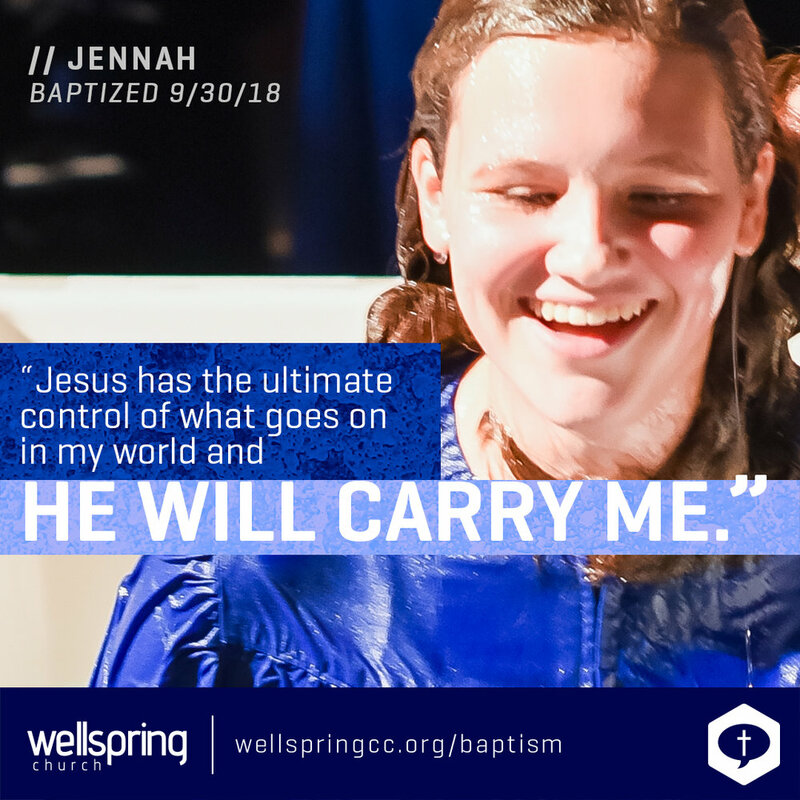 Baptism is a time of celebration at Wellspring Church, and it was a joy to be able to baptize 12 people while hearing their testimonies of salvation in Jesus Christ by faith in Him alone! Here are some of the faces and stories people shared! Praise God for His saving grace! Photos courtesy of Damion Van Slyke. I just had a conversation with my son, who is starting 7th grade track, that my wife and I were track athletes from Junior High through College. My wife was a distance runner and I was a pole vaulter. My son asked the obvious question: How did you even get into pole vaulting? I recounted the story of how, one day for gym class the gym teacher set up the pole vault pits in the gymnasium because it was raining outside. We had a competition and guess who won? Yep, me. I will never forget that day, almost 40 years ago, when this gym teacher, who I admired, looked at me and said I was good and should go out for the track team. That is how and when I developed a love for the track & field. After emphasizing the power of encouraging words on people to my son, I started to reminisce about my career and how it has come full circle now today. I was blessed with a great High School and College career as an athlete and equal success as a college coach. My love for the track events was only surpassed by the love I had for my wife, and life was wonderful. We moved to Allendale, Michigan to a house that had two acres and a barn one mile from Grand Valley State University. I had made arrangements with GVSU's track coach to help with the team. They gave me an old set of pole vault mats that I put in my back yard, as well as other track-related items that I put in the barn to use when the weather was bad. I had it all figured out. I would work during the day, coach in the afternoon and run Pole Vault camps from my home in the evenings and weekends. How could it be any better? Well, by God's wonderful grace, I got saved! My dreams, thoughts and life started to change. I still wanted to do all the same things, but it became much harder. My family was growing, my faith was growing, my business was growing and there came a time that I could not fit all the family, faith, work, and pole vaulting all in. I tried hard to make it all work and thought "God will give me the desires of my heart." He knew the desire of my heart is to continue to do track & field. God was persistent though and eventually I realized that the "desires of my heart" needed to be Him. I took a step back from all things track and field and pole vault and focused on what God was calling me to. After several years of falling deeper in love with God and maturing in my faith I received a phone call from the Chaplain at GVSU asking if I would like to be the new Chaplain of the track team. With much prayer and discussions I accepted the volunteer position. I get the privilege of befriending 160 young adults, getting into their lives and being a Godly influence on a weekly basis. Just recently at the Indoor Conference meet I was able to share my testimony and the Gospel with about 20-30 of them. Some have been coming to Wellspring and I anticipate God is going to do many more wonderful things through them! It's just amazing what God will do for you if you are willing to surrender your life, desires and dreams to him. I am back involved with a sport that I truly love, but, this time for Him and His Glory. Tony Bonacci serves as an elder at Wellspring Church, and is the owner of Stitchtime International. 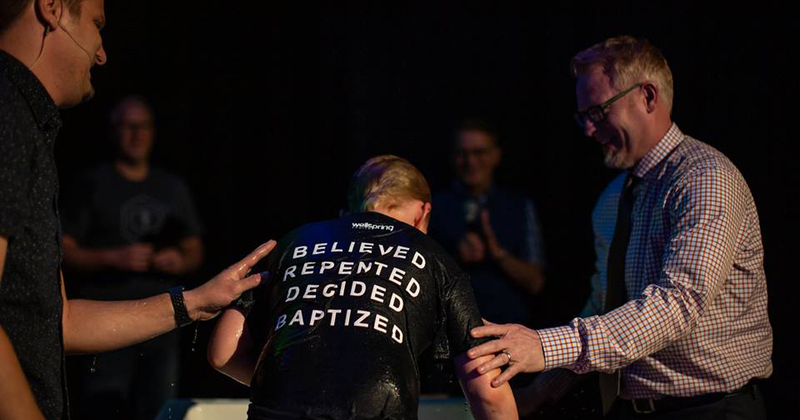 As we prepare to celebrate the resurrection of Jesus on Easter Sunday, we wanted to offer you an opportunity to come and be baptized and share your testimony of salvation during the worship. Do you identify with any of these incredible stories? Is God pulling at your heart to proclaim your salvation through him by being baptized? If so, or even if you’d just like some more information about baptism, click here. I was born into a Christian home, so I gave my life to Christ at a young age. During middle school I was presented with many difficulties, but the Lord gave me hope and strength. I learned that God is with us all the time telling us to come to him, to trust him and to let him carry the weight of our sins and fears. Going into high school I knew that all I wanted was for my Lord and savior to be the center of my life and to sit on the throne of my heart. Over the course of the past few years my faith has really been challenged, but God was by my side through it all, even when I walked away. God has taken my broken heart and made it into something new, he made my pain and suffering into something beautiful that brings him glory. Every day God continues to shower his grace and mercy on me, pouring his love into me. As I read this next verse I just think about how Jesus displayed his love for us on the cross for all to see and here today I want to proclaim my love for him and be made new in his name. At a young age I placed my faith in Jesus Christ, but I didn't realize what meant to me until my family and I lost our house in a fire on Mother's Day of 2016, and then I was diagnosed with a lifelong disease called type 1 diabetes. That is when I realized that Jesus has the ultimate control of what goes on in my world and he will carry me through my life's trials. Some days I just struggle with my diabetes, those are the days I need to lean on Jesus' promises. Today I want to profess my faith and love for Jesus Christ. My name is Sylvia VanderJagt and I am 16 years old. For the past few years, I have loved the thought of being baptized. I started attending Wellspring Church 10 months ago and I knew that it was the right place to begin following the steps of Christ. I have put all my faith in Jesus Christ because he has shown me nothing but good. Whenever I am struggling with something or am in a hard time, I know that God is always there showing me how to get through it. God has shown me that everything truly does happen for a reason and because of that, He has taken me away from the bad and has lead me to the good no matter what it might be. I am getting baptized today to follow the steps of Christ each and every day for the rest of my life and to remind everyone what Jesus did for us: Giving his own life away on the cross to pay for our sins and then rising from the dead three days later. 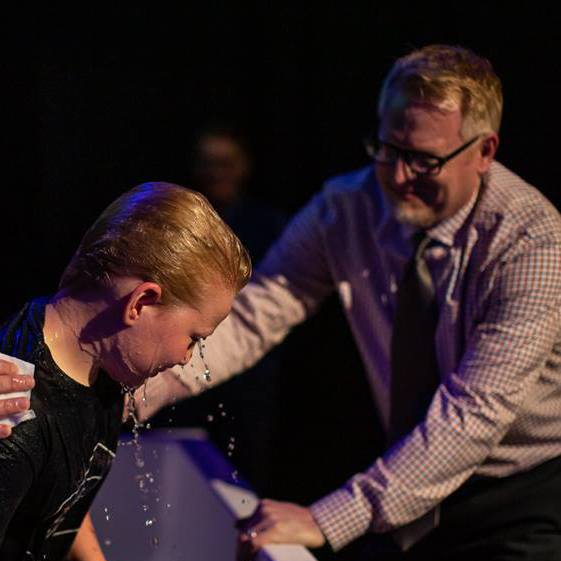 Baptism will forever remind us that the old is gone and the new has come. What about you? Are you ready to take that step? What has God carried you through? Have you ever shared your salvation story publicly? 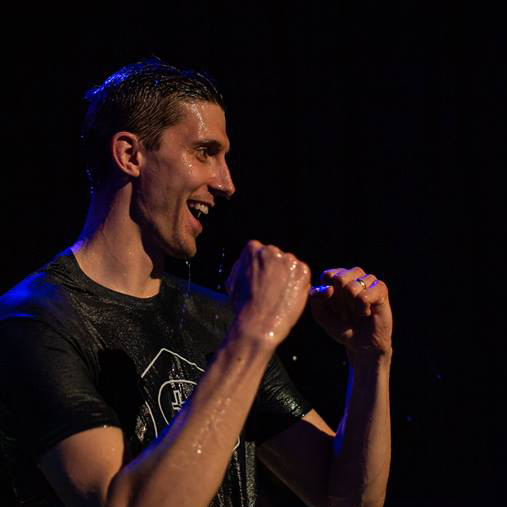 If you would like to be baptized on Easter, send us a note or fill out the form online! 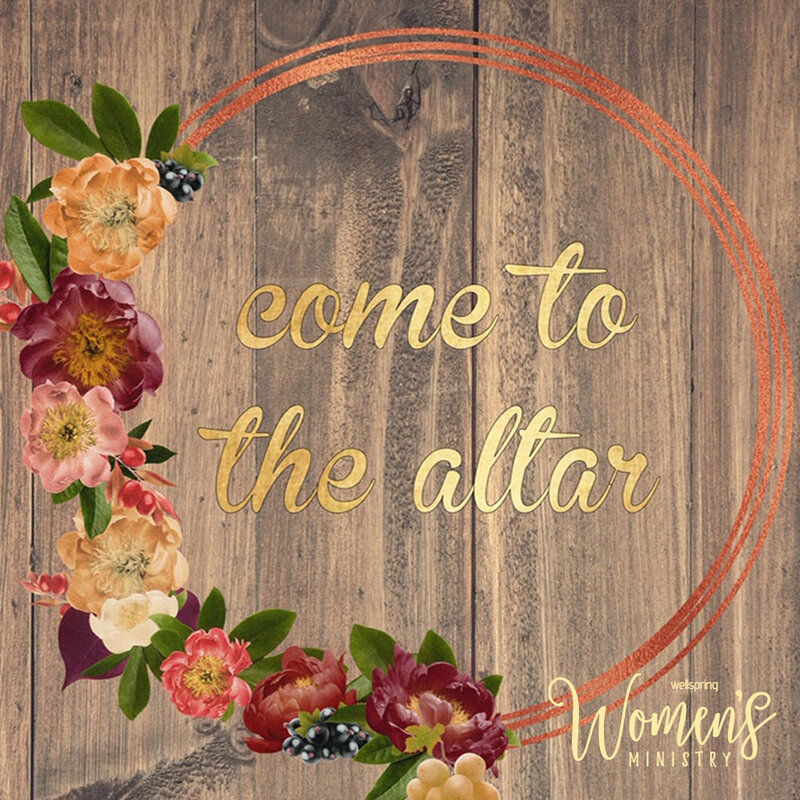 On Friday evening, January 18, many women gathered in the AC for Come to the Altar, a time of focused prayer, fellowship, teaching and encouragement. We were praying God would be glorified and work in the hearts of all who attended, and we wanted to glorify Him by way of sharing a couple of testimonies from the evening. Will you praise God with us for the way He moved through prayer? For more information on the Women’s Ministry at Wellspring Church, please check our website or email women@wellspringcc.org. Wellspring Member Michael Goff recalls the story of the dream where God suddenly led him to move his family from Dallas to Grand Rapids, his obedience in spite of circumstances suggesting he shouldn’t, his steps of faith in action and his persistent prayer. "Instead of praying nervously, God gave me the courage to pray boldly." When the opportunity to serve the church comes up, I usually will try to jump on it. I love to serve and I love talking to people. So why is it that I always feel so nervous when the opportunity to serve is through evangelism? God provided courage to me, and he also showed up in the way he led me to the people I He wanted me to talk to that day. They were kind and easy to talk to, and were the first people I met on an evangelism outreach who had ever asked me to pray for them. I wanted to just hug them for asking me, but they needed prayer, so I prayed with them. Instead of praying nervously, God gave me the courage to pray boldly and with love and compassion for those men. God answered my prayer for courage. He also knew in my heart that I needed to have a positive experience on this trip because I had been getting discouraged from previous outreaches that were kind of discouraging. Whether it was just outright rejection, or feeling like I was annoying people, my form of evangelism just hadn’t been working like I had hoped. So after this outreach I have this excitement and newfound peace in knowing God is with me when I’m obedient to Him and I share His love and His word with others. 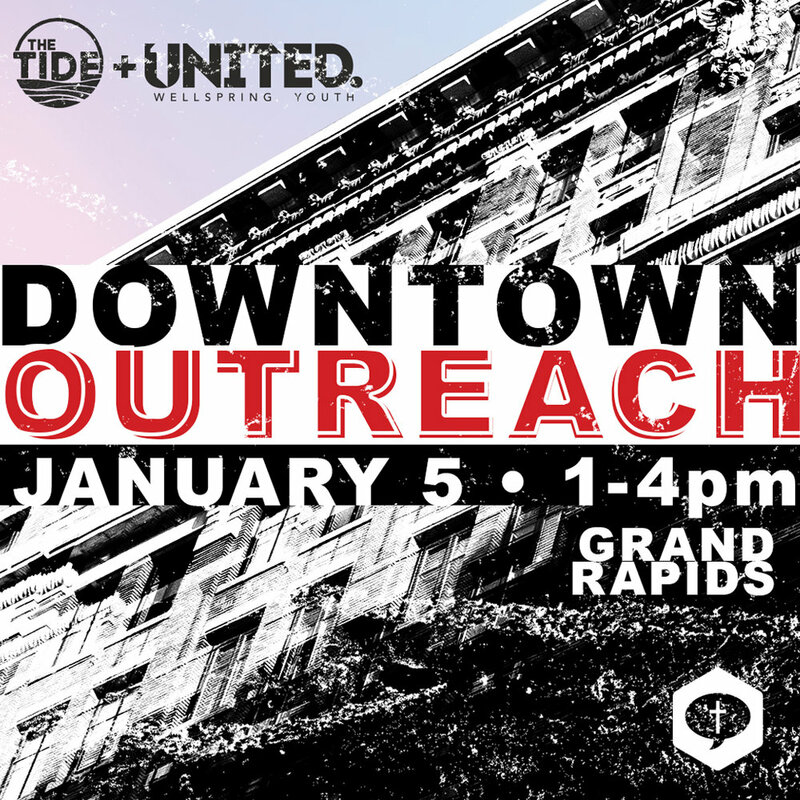 I want to encourage everyone to participate in these outreaches whenever you can! The people that go (that I notice) have such joy about serving it makes my heart happy to see so many give up a Saturday afternoon to go evangelize to those who need Jesus. And it’s such a blessing to able to have community with other Christians in your church that you might not have even known before! Please continue to pray for the world of people who need Jesus as their Savior and for the college and youth ministries at Wellspring Church. 2019 Ice Camp was a Blast! On January 4-6, students in 7th and 8th grades went to the Ice Camp Winter Retreat at Miracle Camp in Lawton, Michigan for a dynamic time of building relationships, worshiping God and having a great time together with the goal of encountering Jesus Christ in a personal and effectual way. Thank you for your prayers! We wanted to share a couple of testimonies from a couple of the leaders on the trip! Thanks for your prayers Wellspring! If your student went on this trip, we encourage you to have a conversation with him or her about some of the concepts that were taught, the worship or the way they connected with God, the leaders, or each other. Please continue to pray for the Youth Ministry at Wellspring Church! And here they were. About thirty days after Jesus’s birth, Mary and Joseph went to Jerusalem to present Him to God as their first born. It was a part of the Jewish law passed down since the time of Moses. The blessing of Christmas is not about what happens Tuesday morning around the Christmas tree, even though the giving of gifts, the love we feel for our family and friends, the hope for peace, and the traditions we celebrate emanate from those magnificent events surrounding the birth of Jesus more than 2,000 years ago. The great blessing of the Christmas story is God invading human history as a precious baby to give Himself so that others could also see His salvation, just as Simeon. Then, just as Simeon, we have the privilege to proclaim it to every tribe, language, people, and nation. Nate, a young man in our Tide College/Young Adult ministry shares how God met Him where He was, got a hold of his life, and showed him how even the most tangled mess of a life can be straightened out and used for God’s ultimate glory! Take a listen and give glory to God for a life changed to make disciples for Him. It is hard to imagine their situation. Nine months before, Mary was young, unmarried, and told she would become pregnant; an even greater miracle than what had happened with her relative Elizabeth. She learned from Gabriel that her baby would be great and would be called the Son of the Most High. He would reign from the throne of David over the house of Jacob, and His kingdom would have no end. Joseph was honorable yet perplexed when reassured by an angel in a dream that Mary’s pregnancy was by the Holy Spirit. They were both told to name the baby Jesus. The Apostle Peter tells us that there is no other name under heaven by which we can be saved (Acts 4:12). It is the name that is above every name and at the sound of that name, the Apostle Paul tells us, every knee will bow and tongue confess that He is Lord (Phil 2:9-10). His Hebrew name means “God saves” and it is that name, the one given to Him by Mary and Joseph, we proclaim around the world. A wonderful testimony of how God saves, yet, it is hard to imagine that there are still places on the planet that have never heard the name of Jesus. More than two millennia after the angelic announcement of good news of great joy that is for a great many, not all have heard. In 1900, there were only 880 million people who did not know the name of Jesus. Today, because of population growth, there are 2.1 billion who have never heard the name that Mary and Joseph gave their newborn baby. Even so, the proclamation of that name brings great joy for a great many. Now, it is for us to proclaim it to a great many more. The evening of Sunday the 16th is going to be a great time. It’s a time where we will stand up together as a family and proclaim the faithfulness of God as a church body and remember His goodness and His work in 2018. How did God work in your life in 2018? What victories and joys do you recall? How did God provide in a miraculous way? What new friendships and relationships did God provide to you? Maybe it wasn’t such a fun and carefree year. Maybe your 2018 contained struggle or deep heartache. Maybe there was a loss of a loved one. Perhaps 2018 was a year through which you were only able to endure by the grace and strength of God. Maybe 2018 was the year of great breakthrough. Maybe you saw the fulfillment of a promise or the answer to long time of prayer. Again, these joys are only by God’s grace. Let’s mark 2018. Let’s remember God’s faithfulness as we go forward with our eyes fixed on Him. Romans 8: 38-39 For I am convinced that neither death nor life, neither angels nor demons, neither the present nor the future, nor any powers, neither height nor depth, nor anything else in all creation, will be able to separate us from the love of God that is in Christ Jesus our Lord. You are invited to join us on Sunday the 16th for our annual meeting. We will celebrate with carols, cookies, cocoa and worship, and we want you to be a part of it! The 2018 school year for our college and young adult group—The Tide—has already been an amazing few months. This year we have been walking through the narrative of Acts which we’ve titled “Obey and Go.” Our goal has been to be on the mission that Jesus has set down for his disciples (and now us) at the ascension: to be his witnesses to the ends of the earth. This year has already been filled with many moments of encouragement and growth for everyone as we challenge each other to be proclaiming the Gospel to our roommates, friends, family, and neighbors. With evangelism and outreach as our focus for the year, The Tide was able to partner with Wellspring’s Hand2Hand ministry at the end of September. We gathered a group of twelve young adults and went out into our surrounding neighborhoods, going door-to-door asking for food donations to support Hand2Hand as well as seeking opportunities to prayer for those we met. Most of us found homes that were very open and willing to receive prayer, while others were met with flat-out rejection. But by the end, it is safe to say that we were all faithful co- laborers in the work that night as we had gathered way more food than we had ever hoped. Many students found the experience to be stretching and yet encouraging to their own faith because they stepped out and were able to do something most of us are very uncomfortable doing—talking about God with strangers. It was a great opportunity for us to lean not on our own strength but on the Spirit to move through us to accomplish His work. Our hope in The Tide is that we begin to see a new shift in our culture here at Wellspring for the centrality of Gospel and its proclamation. Another notable way God has been at work recently is through the growth we have seen at The Tide Brunches on Sunday mornings. This year we have seen record numbers for attendance, one week serving over eighty college students! Needless to say, we were caught off guard a few times, but our amazing volunteers have been more than able to accommodate. (A huge thank you to everyone who helps put on our Brunches from set-up, cooking, serving, to clean-up and tear down. This ministry could not function without your hours of service!) Through the Brunches we are able to reach face-to-face a large crowd of college students that are attending our church services that otherwise would walk in and walk out of our doors without being connected to our church. We have already seen great growth spiritually and numerically throughout the ministry which is extremely humbling. 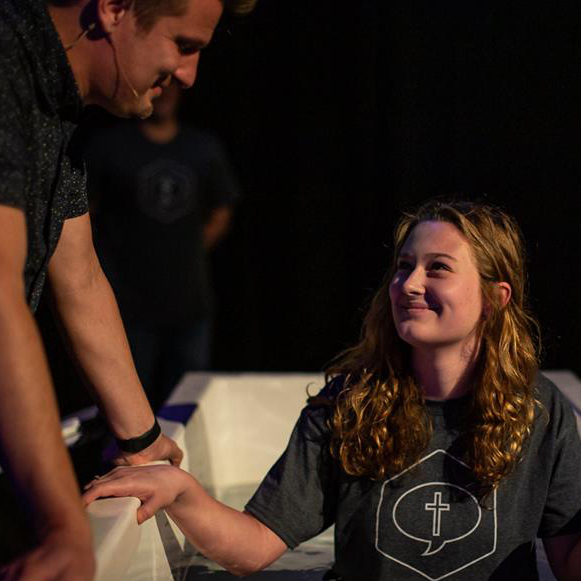 It’s exciting to see the ways God is raising up college students here at Wellspring and I look forward to what he will do throughout the rest of the school year! Engaging in Christ-centered community, developing biblical literacy, and Inspiring obedience to the Word. December is a great time of year. Children are getting excited about Christmas. Parents are frantically looking for the best shopping deals for gifts. College students cannot wait for the final exams to be complete. Families are scouring for the best Christmas tree. And in the midst of the hustle and bustle of the season, we are reminded that Jesus was born. That first Christmas must have been incredible. It was an announcement like no other to a group of people who were of no consequence. I’m not sure what great fear feels like, but it had to be intense. Here was a group of shepherds with their sheep at night; a pitch-black darkness that would have been illumined only by the stars. The shepherds, ever so vigilant and constantly on alert from all sides, would have no doubt encountered fierce wolves who would surround their prey in the cover of darkness. With courage and bravery, they successfully thwarted many attacks by these predators. On this night, however, they were filled with great fear like nothing they had ever experienced. Heaven had opened up to the shepherds. They were all at once surrounded! But, not by wolves. It was the glory of God himself, shining down on them with the announcement of good news for all people. It was the ultimate Christmas gift, delivered in the most awesome manner and it would change their great fear into great joy. After more than 2,000 years, that good news is still being delivered here and around the world. Sometimes I hear stories of the gospel coming to Muslims and Hindus through the announcement of a messenger in a dream or vision. More often, the gospel is shared through personal testimonies of faithful saints, like you and me, who have experienced the great joy of the Savior. And, it always brings God glory when the gift is shared with others. In the midst of the hustle and bustle of the season, the story of the shepherds reminds us to be aware that there are people we will encounter at work, in our neighborhoods, on the bus, or at the shopping mall who might be overwhelmed with great fear but ready to hear the good news of great joy that is for them.